Top Gun offers a New Complete Cleaning Package! 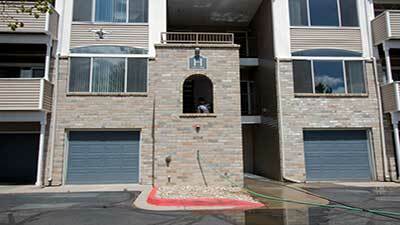 At Top Gun, we provide an all inclusive array of services for your Apartment or Condo's Exterior Maintenance Program. Let us help set your standard of excellence! We clean windows, gutters, down spouts, sidewalks, parking lots, dumpster areas and provide sweeping and striping services. Any type of building exterior including brick, concrete, stone, stucco, wood, metal, and glass. Removal of dirt, debris, bird nests, bird feces, cobwebs, black film buildup or road grime, efflorescence, mineral and lime stains, graffiti, old paint or stains. Exterior window cleaning, gutter cleaning and down spout cleaning. Parking lot/ garage sweeping and striping. Sidewalks, breezeways, patios, courtyards, dock areas, dumpster areas, planters, steps, balconies, pool decks, postal boxes, and common areas. In conjunction with these areas, walls, eves, ceilings, railings and benches are all a part of the overall appearance and also need to be cleaned. From the one story to several stories, glass atriums, eves, glass faces, we clean all types of shapes and sizes at multiple levels. Proper preventative maintenance to every parking lot and garage create longevity and unnecessary repairs. Removal removal of all loose dirt and debris from surface area on a regular basis via curb blowing and industrial sweeping, your striping will last longer with less chipping and grinding. Pressure wash oil spots, food stains, mud or hydraulic spills. Oils spots on your surface and are unsightly. Up against main sidewalks, oil can be tracked onto the sidewalk and into business establishments, even creating safety issues with possible slip and falls. Many building have metal, asphalt or rubber roofs. 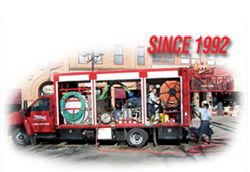 Due to our beautiful Colorado sunshine, seals around equipment, gutters and piping need a good cleaning and inspection. Sealed rubber roofs need a good pressure wash to maintain the seal or or to be cleaned in preparation for resealing. White sealed rubber roof may keep your building cooler and reduce your electric bill, however they also need cleaned to last. HVAC Units have cooling and heating coils that get filled with dirt, debris, leaves, cotton seeds, etc. Cleaning on a semiannual basis will ensure good working condition creating longer life to your units with an extra bonus; cleaning the coils makes your HVAC units run more efficiently, saving you money on your utility bills. Awnings and signage may be out of reach, but they have a normal build up of black mark stains, bird feces, cobwebs, and other dirt. Get them clean by pressure washing, scrubbing, treating with bio safe cleaners in order to renew and maintain a clean company appearance. Please see our Printable Commercial Cleaning Brochure for more information. For a Free Estimate call (800) 234-5685 or Contact Us. Serving Northern and Denver-Metro area of Colorado & southern Wyoming area. We have two locations in Northern Colorado and Denver area serving Cheyenne, Fort Collins, Loveland , Boulder, Longmont, Denver, Aurora and every where in between!